In the ready-made apparel manufacturing sector, garment washing is a new technology. After making garments from solid color dyed or pigment printed fabrics, the garments were washed. By garments washing, color and outlook of the garments are modified. As a result, new outlook and appearance is produced in the garments, which is not possible in any other process. Moreover due to washing, starch materials present in the garments are removed, as a result washed garments could be wearing after purchase directly from the store or shop. Washed apparel could be purchased as per expected size because some apparel shrinks after completion of washing process. Normally garments washing means cleaning of dirty garments with soap or detergent. But it is not that garment washing. 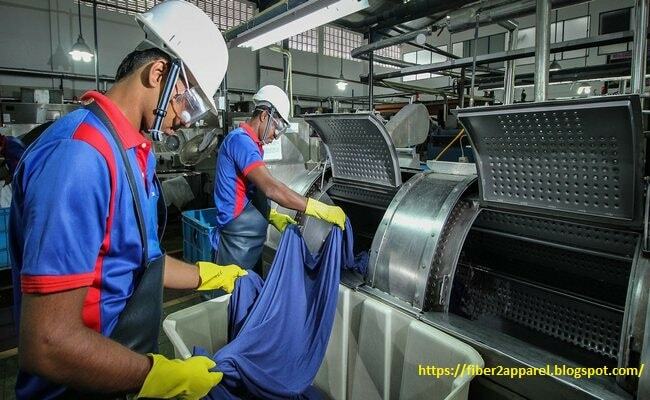 Industrial garments washing is a technology which is applied to modify the outlook, comfort ability, appearance and design of the readymade garments made from solid color dyed or pigment printed fabric is known as garments washing. In our country, garments washing technology started from 1988 and popularity of garments washing is increasing day by day. Feeling and softness of apparel could be further increased. In the garments, dirts and spots are removed if presents. Starch materials present in the new fabrics of the new apparel are removed. As a result, garment feels very soft during use. By the application of various washing methods, different outlook of garments could be produced in the garments. In regular or irregular pattern, fading effect is produced in the garments. After purchasing from store, washed garments could be wearing directly. Initial investment cost to set-up an apparel washing plant or washing factory in Bangladesh is comparatively low. During garment washing, shrinkage occurs. As a result, there is no possibility of further shrinkage. As per specific design, fading effect could be produced in the specific area of the garments. By the application of different washing techniques, similar outlook can be produced in the garments.